Parkinson’s disease is a chronic disorder in which part of the brain is damaged. This occurs over a long-term period and mainly affects how muscle movement is coordinated. The onset of Parkinson’s disease becomes more common with age, typically developing in people over 50. An estimated 1 in 500 people are affected by Parkinson’s. Symptoms include body tremors, difficulty with movement and stiff muscles, although a wide range of physical and psychological symptoms can also be experienced. A number of studies have investigated the link between type 2 diabetes and Parkinson’s disease. In October 2014, an Israeli chemist was reportedly closing on a groundbreaking discovery to understand the link between type 2 diabetes and Parkinson’s. Yifat Miller hypothesised that when amylin, an endocrine hormone found in the brain, clumps together and causes neurons to die, this could explain why people with type 2 diabetes face double the risk of developing Parkinson’s. Statistically, this link was brought to light in 2007 when Finnish researchers found people with type 2 diabetes were 80 per cent more likely to be diagnosed with Parkinson’s. Emanuele Cereda, MD, PHD et al also concluded that while data suggested type 2 diabetes is a risk factor for Parkinson’s, there was no conclusive evidence. Symptoms of Parkinson’s are usually mild at first but tend to become worse over time. However, symptoms and their severity can vary from person to person. The three main symptoms that gradually develop and affect physical movement are tremors, slowness of movement and muscle stiffness. Emotional symptoms such as depression, anxiety and memory problems can also affect people with Parkinson’s. When the part of the brain called the substantia nigra suffers a loss of nerve cells, messages sent down nerves to the spinal cord are affected. These nerves help control muscle movement, with messages normally transmitted through neurotransmitters from brain cells to other nerves and muscles. As the cells become damaged in the substantia nigra, dopamine production is reduced, which would normally play a key role in regulating body movement. This then causes nerve messages to muscles to become abnormally slow, which results in the symptoms of Parkinson’s disease. Why this damage to the nerves happens is unclear. Parkinson’s disease is slightly more common in men, but it can affect anybody. It rarely develops in people under the age of 50, but symptoms experienced in people under 50 may be indicative of genetic factors. 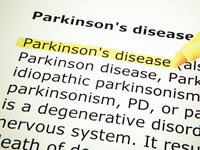 Parkinson’s disease cannot be diagnosed with tests. Instead, a diagnosis is based on typical symptoms, medical history and how you fare with some physical exercises. You may referred to a specialist if your doctor suspects that you have Parkinson’s, in which case a special brain scan may be carried out to differentiate Parkinson’s from other diseases. You should see your doctor as a matter of urgency if you believe you have any of the symptoms of Parkinson’s. No cure exists for Parkinson’s disease, and treatments aim to improve the quality of life for patients and prevent symptoms from progressing. Medication such as levodopa may be used, which the body converts to dopamine, as well as dopamine agonists and monoamine oxidase-B inhibitors. Physiotherapy and speech therapy may be advised if the disease progresses, while surgery could be considered to help ease symptoms when medications are not working well.